The ASK Spanish Club has teamed up with Twisters to raise money for a trip in the spring. Today scholars can put in an order from Twisters during their Career Pathways class, and it will be delivered to the campus for lunch tomorrow. Scholars can either pay when they order, or when the food is delivered. In addition, Twisters will be running a promotion for ASK all day tomorrow. Anyone who brings a flier to the The Twisters located on Hwy 528 and High Resort will help fund the Spanish Club, as 20 percent of sales will be donated to the club. 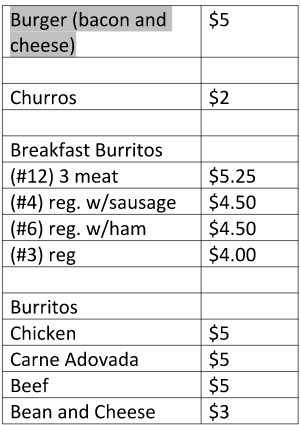 Below is a menu of the food being offered during lunch on Tuesday. Please note that the food truck will not be on campus that day.